JLabel is a component class in SWING package. 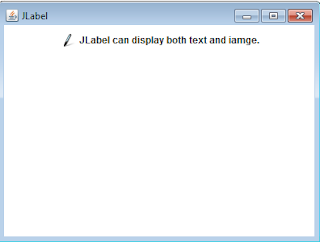 Unlike Label in AWT package, JLabel can be used to display read-only text, image, or both. In default, text displays to the right of the image. However, you can change this default setting by using the setHorizontalTextPosition(int textposition) method. JLabel component can not generate an event. creates an empty jlabel object. creates a jlabel object with the text on it. creates a jlabel object with the text and specified the horizontal alignment. creates a jlabel object to display an image. creates a jlabel object to display an image with specified horizontal alignment. creates a jlabel object to display text and an image with specified horizontal alignment. gets the text on the jlabel object. defines the horizontal position of the text of the jlabel object relative to the image. defines the gap between text and image. In default, the gap is 4 pixels wide. 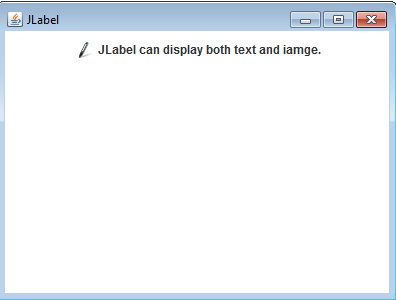 sets the text of the jlabel object. defines the vertical position of the text of the jlabel object relative to the image.